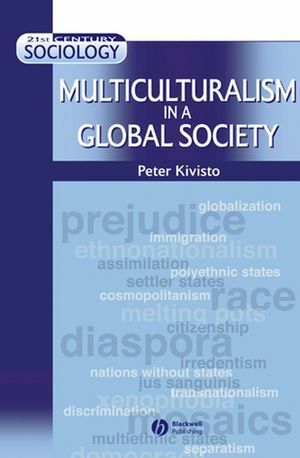 Multiculturalism in Global Society explores the concepts and debates surrounding the complex modern phenomenon of multiculturalism, and its varied effects on the advanced industrial nations of the world. With remarkable clarity and concision, it focuses on the interrelated ties of ethnicity, race, and nationalism in a world where globalizing processes have made such ties increasingly important in economic, political, and cultural terms. Students and scholars looking for the most up-to-date approach to understanding multiculturalism in a global perspective will find this to be an engaging, penetrating, and illuminating text. Peter Kivisto is Richard Swanson Professor of Social Thought and Professor and Chair of Sociology at Augustana College. He is the author of Immigrant Socialists in the United States (1984), For Democracy (1993), and Americans All (1995), and is the editor of The Ethnic Enigma (1989) and Multiculturalism in the United States (2000). List of Figures, Maps, and Tables. Introduction: Multicultural Societies and Globalization. 1. Ethnic Theory in a Global Age. 2. The United States as a Melting Pot: Myth and Reality. 3. Canada and Australia: Ethnic Mosaics and State-Sponsored Multiculturalism. 4. John Bull's Island: Britain in a Post-Colonial World. 5. Germany, France, and Shifting Conceptions of Citizenship. 6. Multicultural Prospects and Twenty-first Century Realities. Explores the concepts and debates surrounding the complex modern phenomenon of multiculturalism, and its varied effects on the advanced industrial nations of the world. Unique – views citizenship as the most important vehicle for enhancing multiculturalism and transnationalism. Wide-ranging – includes in-depth coverage of the U.S., Canada, Australia, Britain, Germany, and France, as well as additional discussion of Japan and Spain. Accessible – written in a clear and concise style for students of sociology and general readers.